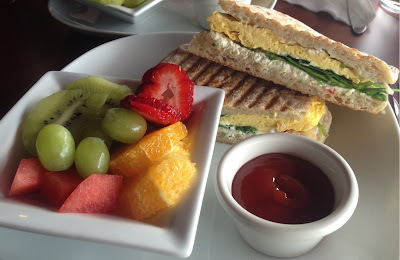 This past weekend my staff writer, Jen and I stumbled into Carly's Bistro; a small cafe in downtown Phoenix. Ok, let's be honest we didn't actually stumble into a place an hour away from our house. We were heading into the city with food on our mind when I noticed a Facebook post from Carly's saying Brunch, Brunch, Brunch. Talk about the power of social media; I immediately called Carly's and asked about reservations. "How many are you?" "Oh come on in...no reservations needed for just two of you." I couldn't help but think why they asked this when we walked in and the place was completely empty. I'll admit we both hesitated a minute; not sure if we wanted to stay or head somewhere else. But the quirky little place kind of appealed to us so we grabbed a window seat and settled in. We quickly perused the brunch menu and both decided on the Greek egg sandwich with a side of fresh fruit. For $6.95 we got a nice portion of scrambled eggs topped with feta cheese, tomatoes and spinach on a toasted ciabatta roll. Served with a bowl of fresh cut fruit...I thought it was excellent and well worth the money. Shortly after digging in things started to get interesting. First, we were no longer the only ones in the restaurant. People were steadily arriving...obviously knowing something we didn't. Second, musicians started popping up and playing from out of nowhere...at least that's how it seemed. Arriving first was a cello player; followed by a drummer. About 10 minutes later a clarinet player arrived and a man with a saxophone. The band just kept growing before our eyes. Whatever was going on I had no idea but they were playing some wonderful jazz. We found out later that Sunday brunch at Carly's includes live jazz...why they all showed up at different times out of nowhere....I guess I'll never know. But if you find yourself in downtown Phoenix on a Sunday morning I would highly recommend stopping in. Whatever you do don't let the empty seats fool you...by the time we left it was standing room only. Any day is a good day to stumble into Carly's! They have a great Bloody Mary and Whiskey Sangria which I think are "Best of Phoenix" fare?